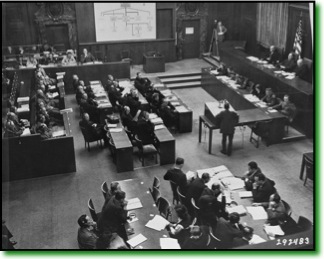 On September 30, 1947, the U.S. Military Government for Germany reconstituted the Military Tribunal to try officials of RuSHA (Rasse- und Siedlungshauptamt), the "Main Race and Resettlement Office," a central organization in the implementation of racial programs of the Third Reich, and other organizations with parallel missions, such as the Lebensborn Society and the Main Office for Repatriation of Racial Germans. 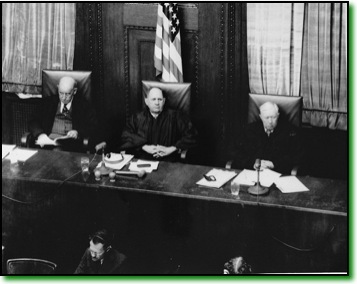 From left to right, the judges were Daniel T. O'Connell from Massachusetts, Lee B. Wyatt (presiding judge) from Georgia and Johnson T. Crawford from Oklahoma. The Chief Counsel for the Prosecution was Telford Taylor. The trial ran from October 20, 1947 to February 17, 1948. 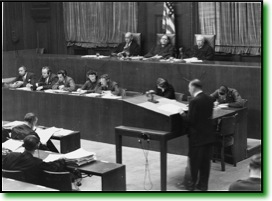 The fourteen defendants were charged with crimes against humanity, war crimes and membership in criminal organizations, based on their responsibility for many aspects of the Nazi racial program, including the kidnapping of "racially valuable" children for Aryanization, the forcible evacuation of foreign nationals from their homes in favor of Germans or Ethnic Germans, and the persecution and extermination of Jews throughout Germany and German-occupied Europe. The tribunal rendered its judgment on March 10. It found eight defendants guilty on all counts, five guilty only of membership in a criminal organization, and one not guilty. The sentences were announced the same day. One defendant was sentenced to life in prison, seven to terms of between 10 and 25 years, five to time already served, and one was acquitted.